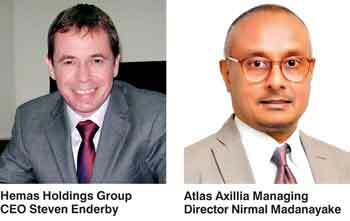 Hemas Holdings PLC said yesterday it acquired 75.1% of Atlas Axillia Co Ltd, Sri Lanka’s leading school and office brand, for a consideration of Rs. 5.7 billion. The existing shareholders of Atlas will retain a stake of 24.9% in the company, post-acquisition. “Both our organisations have a rich history of bringing loved brands to Sri Lankan homes and have served the Sri Lankan consumer with high quality, affordable and innovative products. Both Atlas and Hemas have always felt that our most valuable asset is our team and we strive to empower the people in our organisation. I am deeply proud of the Atlas journey over the past 58 years and of the place that this brand holds in Sri Lankan consumers’ hearts. As we embark on the next phase of growth, we are delighted to have a high quality partner with similar values,” Madanayake added. Hemas Holdings Group CEO Steven Enderby said: “Hemas Holdings PLC is expanding its presence in the Sri Lankan consumer market by acquiring one of the most respected local brands with market leading positions for its notebooks, pens, pencils and colour products. Today’s consumers seek out premium, innovative and design-oriented products and Atlas has demonstrated its ability to do this repeatedly, resulting in its unique position as the most loved school & office brand. Atlas will become the third largest business in the Hemas Group and will operate independently as a subsidiary of Hemas Holdings PLC. Hemas aims to continue to drive Atlas’ excellent track record of sales growth; and strengthen its market leading position, highly effective lean manufacturing and enviable dividend track record. The Group will cross-fertilise brand and marketing insights between the business and its Home and Personal care portfolio as well as deliver route to market excellence through our two significant island wide sales and distribution networks. In addition, Hemas will look to reduce funding costs and enhance talent attraction and development at Atlas. In April 2015 Hemas announced a Rights issue of Rs. 4.1 billion to be invested in FMCG and Healthcare businesses. During the first quarter of 2017, Hemas allocated Rs. 1.45 billion for the construction of the new Morison PLC pharmaceutical plant. The entire proceeds from the Rights issue have now been utilised with the acquisition of Atlas Axillia. Atlas Axillia Co., formerly known as Ceylon Pencil Company (Pvt) Ltd. was founded in 1959 by the Madanayake Family. The brand “Atlas” has created a strong connection to the Sri Lankan consumer, fueled by a passion for providing school-children with the essential tools for success has been voted Sri Lanka’s most loved brand 2017 (No.1). The Company is the market leader in school stationery and notebooks, pens, pencils and colour products, with products retailed in over 70,000 outlets across Sri Lanka. Atlas Axillia brands include “Atlas”, “Zebra X”, “Homerun” and “Innov8”. The Company employs 1,300 people and operates two production facilities in Peliyagoda and Kerawalapitiya. Hemas Holdings PLC, founded in 1948 is Sri Lanka’s leading Consumer and Healthcare business with further interests in Leisure and Mobility. A-Sec Capital Ltd, the investment banking affiliate of Asia Securities Ltd, acted as arranger and sole advisor to the seller on this transaction.